Editor’s Note: There sure is a lot of bacon-related stuff out there. Every day, it seems, I find something new. And yet, there are only so many days in a Bacon Week. “Seven,” you’re thinking. Nope. Going to go with nine this year. It’s just too little time, and I have a few more things I need to share with the world (and my slow-learning co-workers). Bacon Week 2 ends Monday evening. After the bacon-flavored sunflower seeds and last year’s bacon mint debaucle, I thought it was time to bring something tasty to work. The mad scientists over at Lollyphile began with just a couple of flavors: absinthe and … you guessed it. Bacon. Maple-bacon, to be exact. Made with real Vermont maple syrup and an un-named organic bacon. Real ingredients, assembled with care. I felt sure this would be the reputation redemption I was looking for. Unfortunately, the treats got a little too much heat after being left in my car, malforming the lollipops quite a bit. Sorry, guys. Scott: First of all, it was incredibly sticky and difficult to open, and once you got it open, it wasn’t attached to the stick very well, so it came off after a few licks. Secondly, though mine had a liberal amount of bacon bits sprinkled through the maple-flavored candy, they didn’t actually add any flavor at all, unless you got one out and bit into it, and even then, it was overwhelmed by the maple. 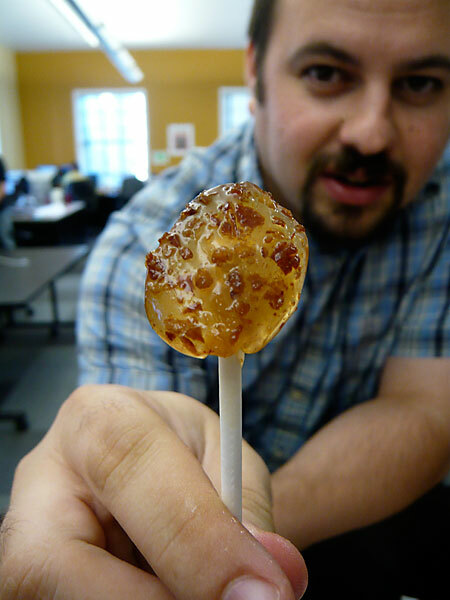 The maple candy wasn’t bad at all, but since I was expecting more bacon flavor, I was disappointed. 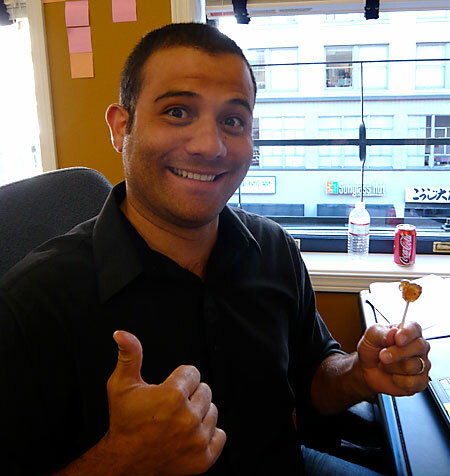 Rodrigo: I think the experience would’ve probably started off better if the lollipop didn’t stick all over my hands. Nonetheless, the super sweet maple flavor is definitely prominent at first… not too much bacon at all. 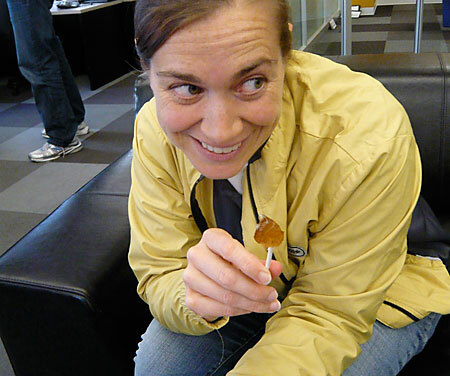 As the lollipop dissolves, rather sticks all over your teeth, I started to feel a subtle bacon flavor here and there. The savory-sweet balance happened maybe about at the half way point—which was still sort of pleasant. After that, bacon bits were being released in high quantity, and the whole thing just kind of got a little gross. The end point just seriously tastes like old bacon from the fridge with a dollop of maple syrup. The overall experience: it was a rollercoaster of weirdness in my mouth! Libby: My first reaction, after I managed after 5 minutes get the sucker open, was that it tasted like a sweet potato. The maple flavor was good, although mine seemed to only sport small shreds of bacon which didn’t give it much bacon flavor. That said, listening to cohorts who had larger pieces of bacon in theirs that behaved “like shards of glass”, I was thankful. Overall, it tasted like maple. And perhaps it was due to the heat treatment it received in Dave’s car, but: it behaved more like a hard caramel than a sucker, and I had to manually reattach it to the stick before I even sampled it. While innocuous, when compared to the Bacon Lip Balm, it failed to prove to me that bacon is a worthwhile sucker flavor, as it didn’t seem to have any bacon flavor.